Conceptions of time and temporal experience seem more at odds now than ever. Hamlet’s hunch that ‘the time is out of joint’ has turned into an evergreen of critical discourse. Admittedly, ideas of physical, social, revolutionary time, internal time consciousness, or historical experience are far from settled in their respective discourses and practices. Yet attempts to harmonize or correlate the understanding of time and temporal phenomena generated in different disciplines all-too quickly – and largely with violent effect – resort to normative, if not teleological ideas of progress, efficiency, narrative sense-making, or experiential plenitude. 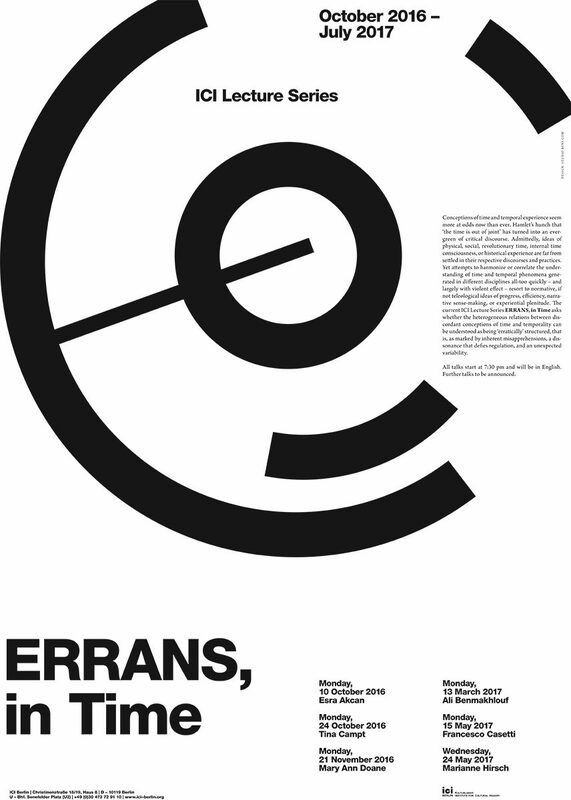 The current ICI Lecture Series ERRANS, in Time asks whether the heterogeneous relations between discordant conceptions of time and temporality can be understood as being ‘erratically’ structured, that is, as marked by inherent misapprehensions, a dissonance that defies regulation, and an unexpected variability. All talks start at 7:30 pm and will be in English. The lecture series is part of the ICI Focus ERRANS, in Time 2016-18. Further talks to be announced.